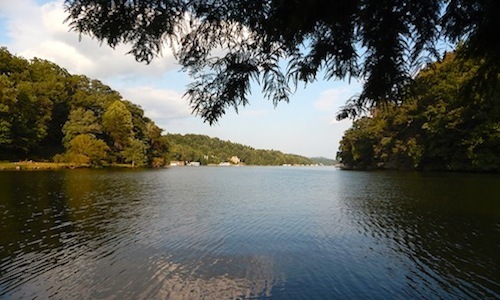 Highlights: The Lake Lure Town Center #walking Tour provides incredibly beautiful views of Lake Lure; the ridgeline of Rumbling Bald Mountain to Shumont Mountain to the North; and the ridgeline of Chimney Rock Mountain to Sugarloaf Mountain to the west. 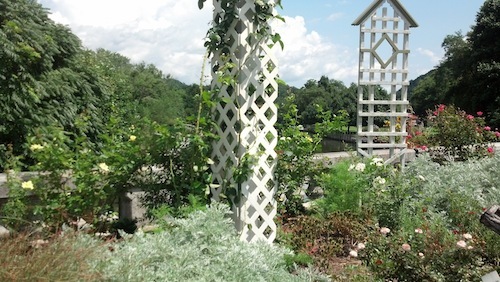 In addition, Morse Park and the Flowering Bridge exhibit an array of stunning flowers, shrubs and trees. Map & Directions: From the Lake Lure Beach – take US 64-W 2/10 of a mile and turn right at the Washburn Marina entrance. Swing right and go just past the marina to see the entrance to Morse Park. Dog Friendly: Yes – There is a doggie waste bag station at the start of Morse Park and several garbage cans along the route, as well as a water fountain at the park entrance. Trail Amenities: Restrooms at Visitors Center, Boat Tour building, Town Hall and Porta Potties if all those are closed. A doggie waste bag station is located at the start of Morse Park. Benches and trash cans are located throughout the area. Morse Park also has public picnic tables, a children’s play area, 2 tennis courts, a full length basketball court and a large green space. As you enter Morse Park and begin your Lake Lure Town Center Walking Tour, you are heading east with Washburn Marina and Sugarloaf Mountain (just over 4000 ft.) on your right. About 100 yards up the trail turn right towards the brick red colored roof of the Pavilion. As you walk forward, you are now looking at Lake Lure Beach and Sugarloaf Mt. Once at the Pavilion, you may want to walk on the shore side boardwalk to the right of the trail to see if you can spot trout in the clear waters of the lake. Hop back on the trail and now you are heading north. Directly in front of you is the ridgeline of Rumbling Bald Mt. on the right to Shumont Mt. (just over 4000 ft.) on the left. All the exposed granite along the side of the mountains makes this a spectacular view. Walk past the entry trail on the left and take the next right fork. This trail gives you a direct view up the west finger of Lake Lure. Continue on around the peninsula and now you are heading west with the Broad River on your right. Continue straight across some grass. Once you have cleared the canopy of a few trees, you will be looking directly up Hickory Nut Gorge. To the left of the gorge is Chimney Rock Mt. and on the right is Buffalo Hump Mt. Continue straight on the gravel road along the side of Broad River for 3/10 of a mile (400 yards). You will pass by the kids playground on the left and just beyond is the Town Hall building. Head left to walk on the sidewalk by the Town Hall building. As you walk beyond the Town Hall building, you will see a sidewalk that takes you along side US64 – turn right along 64. 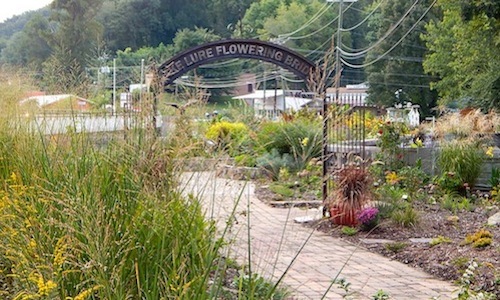 The sidewalk takes you to Lake Lure’s Flowering Bridge. The Lake Lure Flowering Bridge is a scenic pedestrian walkway featuring 155 feet of beautiful gardens along the bridge itself and nearly twice that length when you include all the neighboring grounds that are filled with a variety of blooms and bushes that pay homage to Western North Carolina’s natural flora. Once a busy thoroughfare that connected Lake Lure to Chimney Rock, this historic bridge built in 1925 was reclassified as a pedestrian walkway in 2011 when a new bridge was opened to traffic. It’s one of only two such Flowering Bridges in the country and a true delight to the senses. 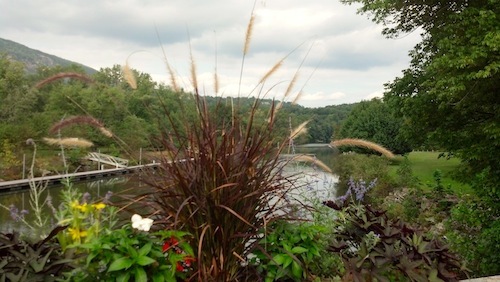 The bridge changes with the seasons and with the continued expansion, there’s always something new to see. As you approach the bridge, you will see a white mailbox. Inside is information about the bridge and the garden and planter descriptions that are on and around the bridge. 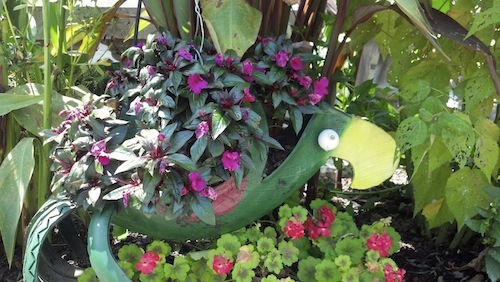 You can download the Lake Lure Flowering Bridge Planter Descriptions here. At the end of the Flowering Bridge, turn around and head back the way you came in. As you pass back under the entry arch, you will notice a black box on the left. Please leave a small donation if you are so inclined. As you walk back, continue straight passed the Town Hall building. On the left you will notice the newly remodeled Visitors Center. Inside you will find brochures on things to do in the area and an interesting “history of Lake Lure” room. If you have had enough walking, head back toward the marina and your parking spot – (you have completed 1.5 miles). For an additional ½ mile (round trip), head to the sidewalk on the right side of the marina. 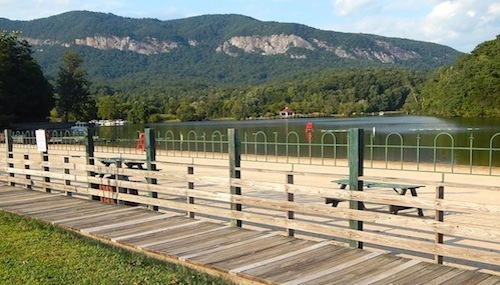 This leads to the board walk beside the lake which leads to the Lake Lure beach. Walk to the second beach house; turn around and head back. Awesome views and good exercise! 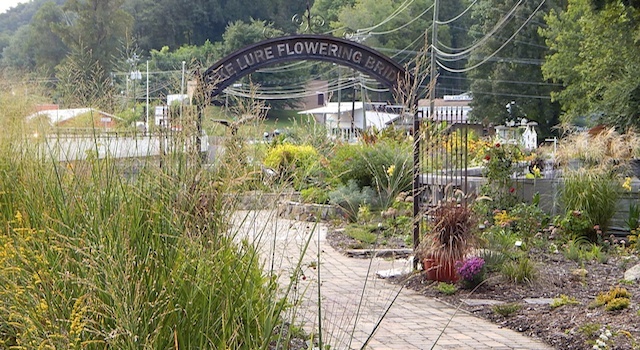 The Lake Lure Town Center Walking Tour is a personal favorite walk for us that we often take with our friends and visiting family members and our dogs just love it! Please clean-up after yourself so others may enjoy the beauty of the park.